I recently found a Roland D-50 Linear Synthesizer in near mint condition for $180 at a somewhat remote used music shop here in Nagano-city, Japan. It really was in near mint condition with all of the documentation, case, cables, memory cards, etc. Somebody clearly had taken great care of the D-50 and I felt I couldn’t let this one get away. Back in the 80’s I remember purchasing a brand new Yamaha DX-7 mkI when they came out. Soon thereafter the Roland D-50 was released and I remember I always kind of wished I had bought one instead of the DX-7. However, I always reminded myself that the Roland D-50 wasn’t around when the DX-7 was first released. 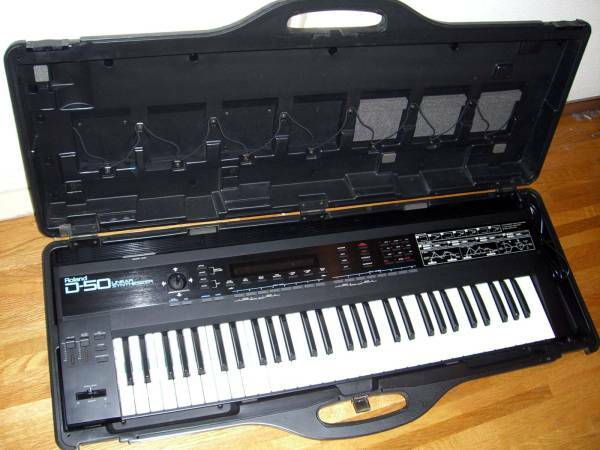 I had saved my paper route money for the DX-7 and at that time as a kid it would have probably been difficult to sell and convince my parents that I wanted a Roland D-50. I just remember that when the Roland D-50 was out, everyone wanted one that played the keys in high school. It was just a cool synth. I’m now glad to have one sitting alongside my Yamaha DX-7 synth. Both are still amazing synthesizers after all these years and the number of patches available is practically endless. There is also a really cool Roland D-50 Librarian and Sound Editor available that really adds to the D-50 fun and experience as well. Check it out and please comment if you know of any other great resources for the Roland D-50. I know there are quite a few Roland D-50 librarians and editors out there. Thank you! It features a library which can be used to store all your patches in one convenient place. 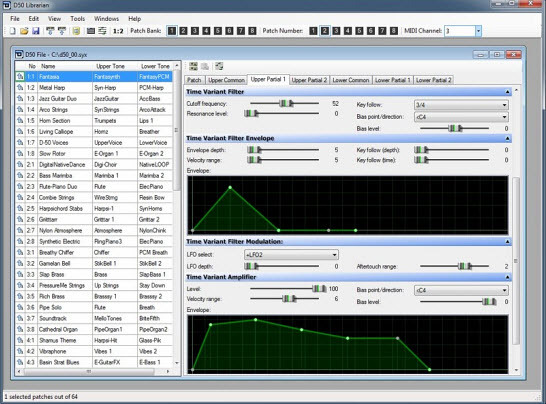 Patches can be transferred easily between the D50 Librarian and the D-50 / D-550 via MIDI. 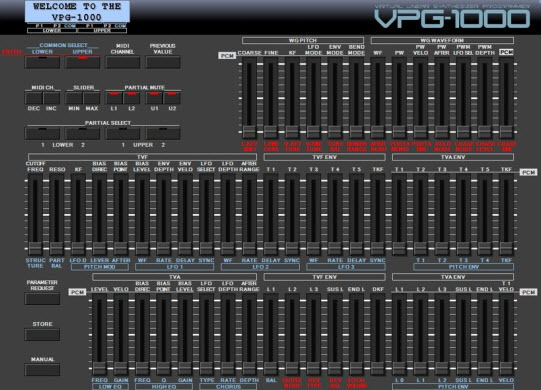 Patches can be edited in real-time via one or two real-time editors including a virtual version of the PG-1000. It’s also worth mentioning that I’m very inspired by an 80’s synthpop enthusiast who goes by “synthfreq” on youtube. http://www.youtube.com/user/TheSynthFreq . She uses the Roland D-50 extensively in her live and studio setup. She also writes her own patches for the Roland D-50. What’s amazing is how very well she captures that 80’s synth feel that I grew up with as a kid. Here is an example video of a tune she does called “Night”. The Roland D-50 is the upper most synth played in the video. Check out her other videos too for more great Roland D-50 80’s style sounds and playing. Simply fantastic!! Synths used- roland D-50 (preset patch), JV-880- lead sax, Alpha Juno-1- synth bass w/delay fx, Motif6- midi to CZ-5000 (strings), Yamaha DX-9- midi to JV-880. Korg EMX-1- new 80s pattern. I absolutely love that Alpha Juno-1 Synth Bass sound in Synthfreq’s video. It has a really great resonating bounce to it which was very common in the 80’s. I could not help to notice that synthfreq wears hearing device on her right ear. I have even more respect for her now! Yes. I think I read somewhere in one of her Youtube comments that she is can’t hear a certain frequency range. This explains why she can hear music, but not at all frequencies. I also think she might be partially blind as well. Her sister plays too and they both are really passionate about their music. It’s fun to watch. Update: I just ran across synthfreq’s info about her hearing aid when viewing her “Night Sky” video below on Youtube. Very interesting and quite amazing. I wear ultra-power Phonak Naida V hearing aids. I’ve worn hearing aids for 15 years. My bilateral high & low freq mixed/Sensory Neural hearing loss (since birth) effects my ability to hear Low Fs & no Hi Fs, I transpose octaves to mid ranges when writing bass/﻿ lead lines. My hearing aids ‘transpose’ frequencies in ‘dead’ areas to mid range freq area that I can hear in & amplify sound over 110+db. This is the first time in my life to be able to ‘hear’ around 3000kHz. Here’s another video by synthfreq that’s pretty cool using the Roland D-50. Here is a great demo of the Roland D-50 Synthesizer. Are sure that i can get a Roland W-30 disk drive at Floppy Drive Solutions? How to order one there? A guy named “Jamie” helped me with my purchase. I just bought a Roland D-50 Patch collection today off Ebay. This is the description of the product which sound pretty good to me. I already have quite a few Roland D-50 patch sets, but it’s always nice to get something well organized such as this. Roland D50 / D550 / Vsynth D50 patch libraries cd featuring over 120,000 individual patches for the D50 plus software editors including Soundiver 3 for the Pc. The cd contains many many rare and hard to find banks for the D50 including those listed on the second image uploaded and some beautifull sounds ranging from classic D50 ethnic patches to bass sounds and also all those stunning glassy pads and strings and bell like tones that the D50 is famous for. A unique feature of this cd is that we also sorted and created a series of sysex banks of the sounds in order ! So you have all the bass sounds grouped , all the pads , all the bells , wind instruments etc grouped which saves hours of work.The cd also includes all the Rom preset cards ! yes……all the pcm rom cards that were available for the D50. Today I just bought my second Roland D-50 for $150 which included the hard shell case, manuals, and the following three Rom Cards in amazing condition. I couldn’t pass up the deal. The sales guy spent an hour cleaning it up with a nice shine! It’s been an amazing month for deals in Nagano-city, Japan. In case anyone gets an “”Illegal Card” message on any of their Roland D-50 ROM cards, I found that spraying contact cleaner on them usually clears up the problem. I had this message on the KV-502 “Bo Tomlyn Top 40″ ROM card but after cleaning the gold contacts with cleaner it worked great. Hi Jim. “DavRBailey” here from YouTube land. I know this is an old post of yours, but I was Googl’ing anyone who uses Chris Knight’s “D-50 Librarian” software and saw your article. I absolutely LOVE his program that he wrote and was motivated to donate some money on his website at the time for it. He was very appreciative and asked what I’d like to see added. I asked about editing the reverbs on the user-changeable locations and he set right to work adding in a reverb editor. He was also excited to report that the reverb locations show a red flag for any reverbs being used by patches, and if you hover over the flag, it will even tell you which patches are referencing those reverbs, so you’ll know if you care about editing that location. Pretty cool custom programming just because I asked for it. I haven’t found any other editor/librarian out there that compares. Glad to hear you’ve found it. Also super awesome to hear you have TWO! I have my original D-50 purchased on Tuesday, 1/26/1988 and two D-550’s I’ve added in the years since. Love that synth!